Denver's City and County Building (City Hall) is located at 1437 Bannock Street, Denver CO 80202; phone: 720-913-3050. 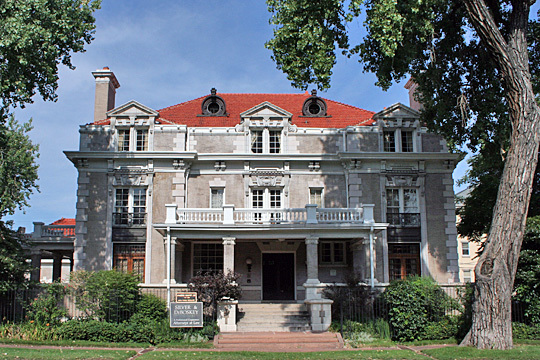 Photo: Frank L. Smith House, 1801 York Street, Denver, built ca. 1891. Listed on the National Register of Historic Places in 1995 Photograph by Jeffrey Beall, 2009, (own work) [cc-by-3.0 (creativecommons.org/licenses/by/3.0)], via Wikimedia Commons, accessed September, 2012. Denver is a consolidated City-County governed by a mayor and 13-member city council. In the fall of 1858 a settlement of miners and prospectors grew up in the vicinity of the " diggings " where the Green Russell party found gold. The confluence of the Platte and Cherry Creek made a natural site for a town. In the winter of 1858-1859 there were a hundred log cabins on the east and west banks of Cherry Creek. The village on the west side of the little stream was called Auraria; that on the east side was named Denver, after James W. Denver, then governor of Kansas Territory (which extended westward to the Rockies). For a year the two towns maintained a separate existence, and then were united into one burg with the name of Denver City; thenceforth "Auraria" passed into history. The spring of 1859 brought an enormous influx of "Pike's Peakers," and Denver suddenly sprang into an important city. It became a base of supplies for the mountain towns and mining camps. As the years rolled by, it forged ahead and outstripped all its rivals in Colorado Territory. In the 1860's Denver was dubbed "The City of the Plains." In the 1870's it was recognized as the metropolis of the Rocky Mountain country and got the nickname "Queen City of the Plains." In 1881 it was chosen as the permanent capital of the Centennial State. The Capitol is situated on Capitol Hill, 1-1/2 miles from Union Depot and about one mile from the post office. The corner-stone of the Capitol was laid July 4, 1890. Although the building was not completed in 1895, the Tenth General Assembly met in it. Some of the decorative details of the State House were not finished until 1900. The cost of construction exceeded $2,500,000. Mr. E. E. Myers of Detroit was the architect. The Capitol site includes 10 acres of land, given to Colorado Territory by the late Henry C. Brown. The building stands in the center of a beautiful terrace. The west front faces Broadway; the north front faces Colfax or Fifteenth Avenue (the entrance being directly opposite Sherman Avenue); the east front faces Grant Street; and the south front faces Fourteenth Avenue. The Colorado Capitol is a majestic edifice, cruciform in shape. It was built of native granite, and finished inside with Colorado onyx. The structure is of the Doric order of classic architecture, with Corinthian ornamentations. In its general appearance it is characterized by simplicity and severe grandeur. The interior decorations are tasteful and artistic. The Capitol is 384 feet long from north to south, 313 feet wide, and 102 feet high from the ground to the cornices. The distance from the ground line to the top of the globe on the dome is 276 feet. The building contains altogether 160 rooms.